In previous generations, women and young couples would begin their families much earlier than they do today. Among adults, the age difference between them and their mothers is not nearly as large as it is for them and their own children. At least one in five women waits until after they have reached 35 years of age to start their families. This is a smart choice for several reasons — whether it is maturity, financial stability in their careers, or the fact that they have finally found the right partner and have a stable, healthy relationship. Unfortunately, as women age, so do their ovaries. Eggs produced by older women have issues that are not seen in their younger counterparts. Infertility rates tend to be higher, as are the rates of failed pregnancies and recurrent miscarriage. 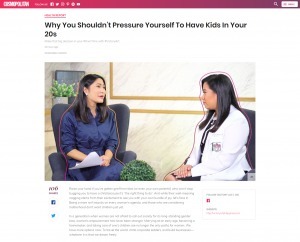 For women who may be putting off childbirth for career-related reasons, or are simply not ready for parenting, or have not found the right partner, egg freezing (oocyte cryopreservation) may be a wise investment to consider. Historically, sperm and embryos have been successfully cryogenically preserved and resulted in successful pregnancies and live births. On the other hand, the advances in egg freezing, which involve a rapid-freezing method called vitrification, are a fairly recent technology. Pregnancy rates using embryos that have resulted from frozen eggs are steadily increasing, and over a thousand healthy babies have been born worldwide from frozen eggs. Oocyte cryopreservation is an expensive option, however. The process involves fertility drugs to stimulate the ovaries, and the eggs are harvested via surgical procedure. Storage of the eggs and thawing them also contribute to the already prohibitive costs. The adage “Better late than never,” does not apply to oocyte preservation. Early investment is preserving reproductive tissues is very important for finances and for fertility. The younger and healthier a woman’s eggs are, the more likely she will conceive. However, it is important for even a young patient to remember that egg freezing is not a method guaranteed to result in a genetic child. Not every egg will survive the thawing process, and not every fertilized egg and will develop into a healthy embryo. •	Women who have lifestyles (e.g. travel, school or career choices) that will delay their attempts to get pregnant until age 35 or older. For many health professionals, 38 years old is the arbitrary cutoff for most women seeking oocyte cryopreservation, with a normal FSH and AMH hormone test.